Adobe Reader is the best PDF files reader, no matter on mobile platform or on desktops. The features offered by the Adobe are seamless. 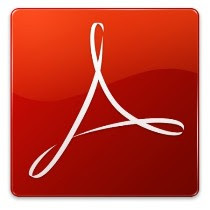 The Adobe reader desktop version have been very popular and widely used by users, but with the passage of time, the need of similar software was felt for various mobile platforms. For people who are addicted to reading the ebooks these software by Adobe are just like a boon. You can also bookmark you favorite files, and use features like jumping directly to a specific page (go to page 458), so that you don't have to do so much scrolling. Now this feature is perfect for phones, smartphones these days have literally long screes ;) like iPhone5 .. So, you can rotate the screen in the pdf software for wide screen viewing your pdf files. So overall this software is a must have software in your mobile, tablet, desktop, laptop and just everywhere. Update: In the latest version of the windows and Macintosh versions , users can highlight the text while reading, add comment bubbles to the file and last but not the least users can add notes to the files. Thus with these updates one can use adobe for preparation of presentations.